Shopping, paying bills, looking for information, getting advice, answering questions: If you do almost anything online these days, you’ve probably encountered—and maybe used—live chat to communicate with a company. If so, you’re not alone. Use of live chat in customer service has soared from 30% in 2009 to 52% in 2013 and continues to climb. In fact, nearly a third of consumers expect live chat to be available when they come into contact with a brand. Customers have also reported highest satisfaction rates from a conversation on live chat (73%) as compared to traditional platforms like email (61%) or phone (44%). Most organizations now provide agent support for their customers across multiple channels including email, phone, social media, and chat. Why? Because today’s customers expect an array of options when it comes to customer service. More fundamentally, it's because businesses are fueled by the whims of their customers. The purchases, satisfaction, ongoing engagement, and loyalty from customers are what drives a company’s growth—and engaging in a live conversation through chat can help with all of these. If you’re busy running a company while looking for new ways to make your agent more productive and efficient—all while holding the line on expenses—then live chat is the perfect candidate. No matter what your company’s business or story may be, now’s the time to seriously consider adding live chat to your customer service arsenal. Through the Zendesk Suite product family, agents can use Zendesk Chat for a variety of customer needs. 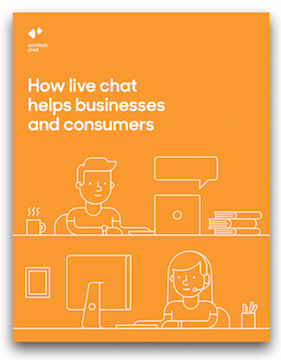 In this ebook, we'll look at the value of live chat first from the customer’s point of view and then from a business standpoint. These viewpoints are closely tied together, because when customers are truly satisfied, your bottom line inevitably grows as well. No matter if your company is a small app maker or a major enterprise; providing chat support can make a huge difference.